The club was formed in 1936 with their early years being spent in the West Yorkshire League and the Heavy Woolen League. After World War 2, they joined the Yorkshire League. Fortunes varied wildly as more divisions were added with highs of 6th in the top tier in 1951 and 1979 to a low of 8th in the third tier in 1971. In 1982 a reorganization of the non-league system was implemented and Ossett Town were placed in the Northern Counties East League. Various moves happened, the club eventually being placed in Division 2. 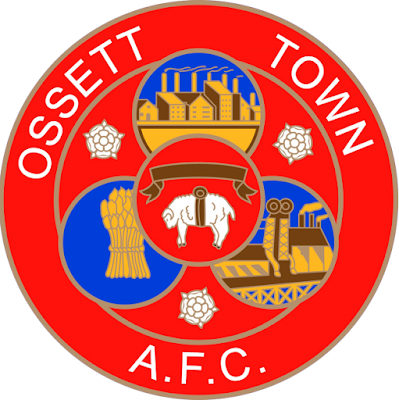 Ossett Town were promoted to Division 1 as champions in 1989, with a 3rd place finish behind Rowntree Mackintosh & Liversedge the following year being good enough for promotion to the Premier Division. 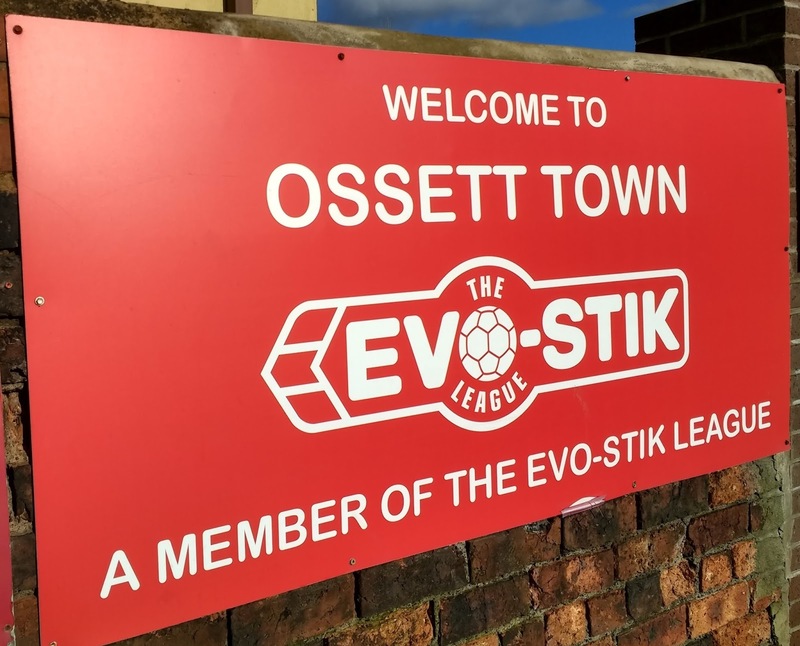 They'd remain here for a decade, with a runners-up spot behind local rivals Ossett Albion being good enough for promotion to the NPL D1 in 1999. 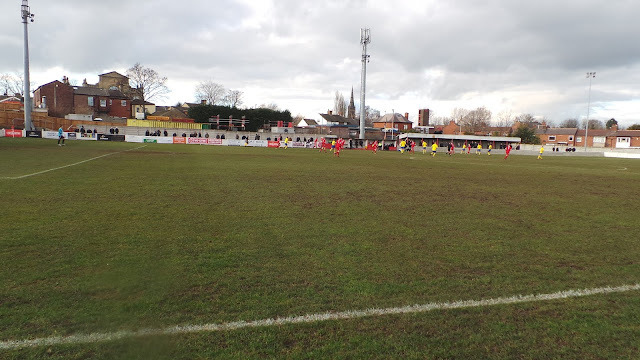 They adapted to their new league well, finishing as runners-up behind Harrogate Town in 2002. However, they were denied promotion due to the required ground improvements being completed 12 hours too late, even with the delay being due to inclement weather. In 2004, promotion was finally earned due to reorganisation following the introduction of the Conference North & South. A seven-season spell in the NPL Premier followed, with a best-ever finish of 10th in 2007. Since relegation in 2011, the club has played in NPL D1 North. Last season was their best since returning, a 4th place finish ended with a 4-2 defeat to Farsley Celtic in the playoff final. This season has seen the side in mid-table, with an outside chance of making the playoffs with a good run of results. In the FA Cup, Ossett Town has reached the 4th Qualifying Round twice, firstly in 2005 when they lost 3-2 at home to Leamington, then this season when they lost in a replay after gaining an excellent draw at Conference outfit Solihull Moors, missing out on a home game against Wycombe Wanderers in the process. The club made their FA Trophy debut at the turn of the century, losing 1-0 to Doncaster Rovers in the 2nd Round. The FA Vase 5th Round was reached in 1999, a 2-1 defeat at home to North Ferriby United ending their run. Local cup wins include the NCEL League Cup in 1990, the West Riding Senior Cup in 1950 and two West Riding County Cups. The club's record attendance of 2,600 came for a 1988 friendly in which Lee Sharpe made his debut. The town of Ossett has a population of 21,131 according to the 2011 census. The town has a history in coal mining and was also home to software house Team17 who produced the computer game 'Worms' with a number of references to the town included in the game. Famous people from Ossett include the pop group 'Black Lace' and actress Helen Worth who plays Gail Platt in Coronation Street. 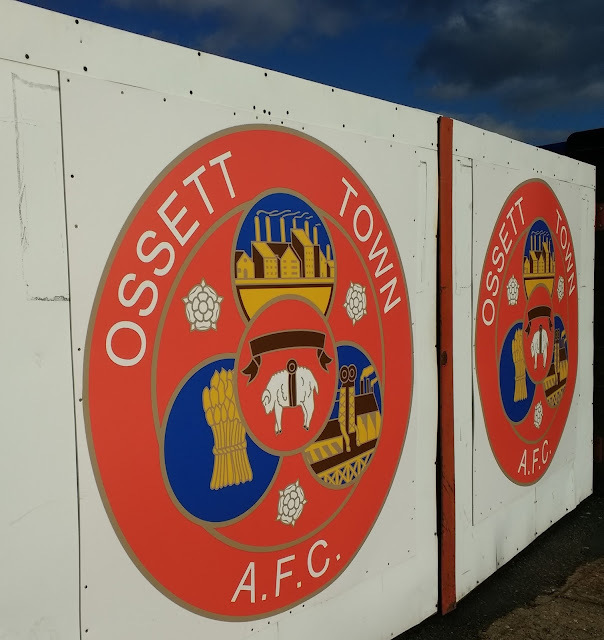 A number of people in football have connections to Ossett, including current referee Bobby Madeley. The most well-known footballer to turn out for the side is former Newcastle defender John Beresford. Currently, singer Jake Quickenden plays for the club, but the most valuable player to the club is Derrick Blackburn. His sale to Swansea Town netted the club a cool £1,350, a significant sum back in 1957 and one that allowed the club to purchase their current ground. I'd been wanting to visit Ossett Town for a while, owing to some good pre-match options in the way of pubs amongst other things. I'd nearly been back in October for their FA Cup 4th Qualifying replay with Solihull Moors but I couldn't persuade fellow hoppers to come and help me out with fuel costs. I was disappointed when they lost out to the Conference team, as it meant I couldn't go with Wycombe either after we were drawn away to the winners of the replay. 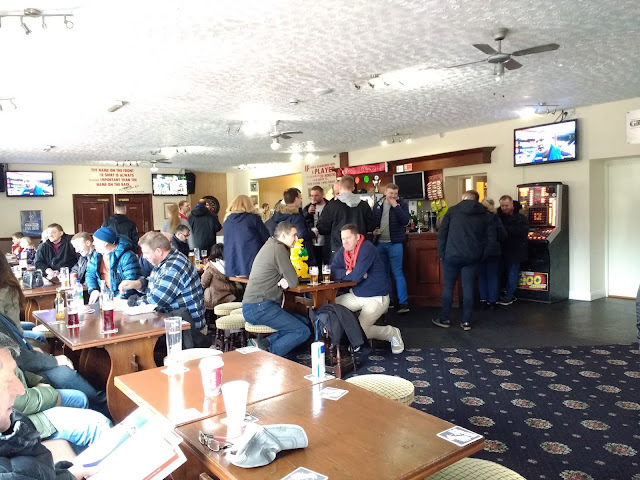 The need to visit was accelerated last week with a merger between Town, and their local rivals Ossett Albion. 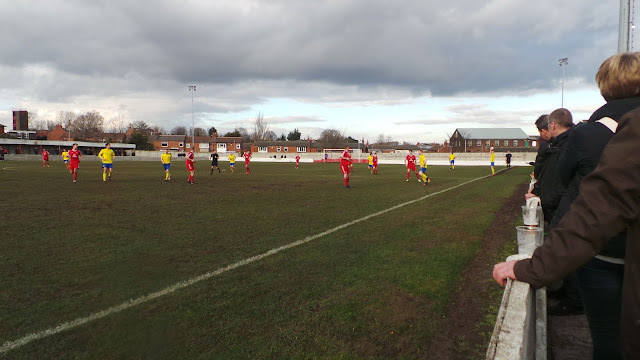 I'd been to their rivals a couple of years ago, getting there right on kick-off as a flurry of late postponements meant a last minute dash for a game. I really enjoyed my time there, including some very nice pork pies and regretted that I didn't have more time to spend there. Unusually for me, I acted quickly to get the ground in before its potential demise, booking a hotel and arranging a trip within half an hour of seeing the tweet. I'd be seeing a game at Nostell Miners Welfare on the Friday and even Rochdale v Tottenham Hotspur on Sunday after I was lucky enough to secure a ticket. I'd chosen not to go out on the town the night before the game, but I was still up until just after 1 am after listening to the Two Mikes whilst typing my blog. I woke at 7 am having had a semi-decent night's sleep. I stayed in bed, catching up online and uploading last night's blog. After having a shower, getting dressed and watching some YouTube videos, I went out at around 10, having been just a little bit too late to get the previous bus. I was expecting to be visiting a few pubs today, but that would come later, first off I fancied a look around Wakefield. I took a slow walk around town while I listened to the Two Mikes. After buying a Fiery Mexican chicken sub from PoundBakery for my breakfast as well as F1 2010 for the PS3 for 20p, I started my journey to Ossett. I caught the 11.30 bus, getting to Ossett just before 12. I had 3 pubs earmarked, although 2 of them were just for food really. My first port of call was the excellent Bier Huis. Really an off license that you could also sit in, this was ‘Independent Cider Retailer Of The Year 2017’. A bold claim, but a well deserved one, as it had a huge range of bottles, this would prove useful for later as I wanted to take some home with me. I’d been restricted to cans of Strongbow yesterday and if they were bland, my first pint of the day was anything but. Udders Orchard Brigantia was a medium dry and had an impressive depth for something at 5%. Plus it was made just down the road in Huddersfield, a well-known mecca for discerning drinkers. Next up, I had to move to bottled cider, but another from Udders Orchard, one called Luddite was even better. Dry, just like I like it, it was well worth £2.95 a bottle. I passed the time by watching Sheffield Wednesday v Swansea City on the excellent SkorLive website, a great recommendation I'd found thanks to YouTuber Dr Squiffy. My third and final pint before going in search of food was a Naylor's Black Cherry. A bit too sour for my liking compared to my previous cherry beers, I was determined to finish it off before I went. 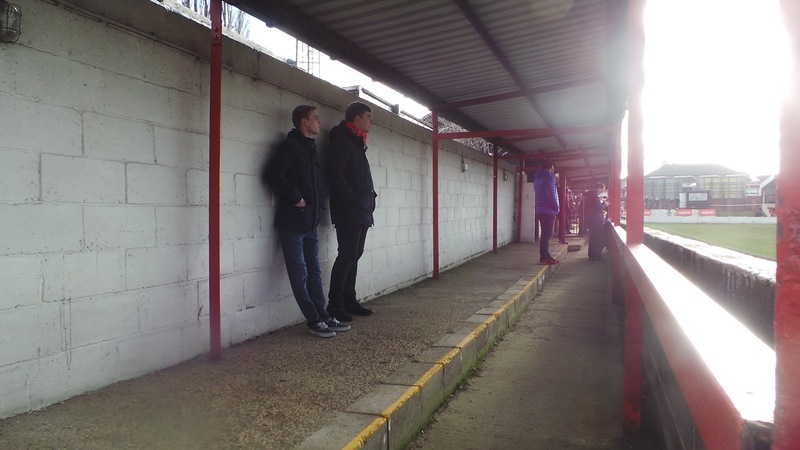 I couldn’t find anything decent with a brief walk around Ossett, so paid a tenner to get into the ground including my £2 programme. After getting a spicy chicken burger and chips for £3.50 I went in the bar, getting a pint of Old Rosie for £3. It was clearly out of the box that I’d got for £15 from Morrisons on Black Friday but I was glad to support their venture. Before the game, it was back to the tea bar for a portion of Chilli & Chips for £3. The first half was pretty dull, but I popped out to a shop to get a drink of Irn Bru at halftime. A quickfire double from Luke Porritf gave the visitors a commanding two-goal lead at the start of the second half but it was harsh on Ossett as there wasn't much in the way of chances. That was how it stayed until the end, with neither side offering much in the way of inspiration. After the game, I went to the Beer Huis to pick up some bottles for the evening, something nice obtained to have with MOTD. From there it was a bus back to Wakefield, I called in at the Hop, having a pint of Bad Apple. It was one I’d not had for a while, in fact not since I was here a year ago. I took my time over it, almost an hour in fact, before moving on. Next stop was Harry’s Bar. Here I had a Hallets Perry amongst friendly locals, though it was another repeat for me. 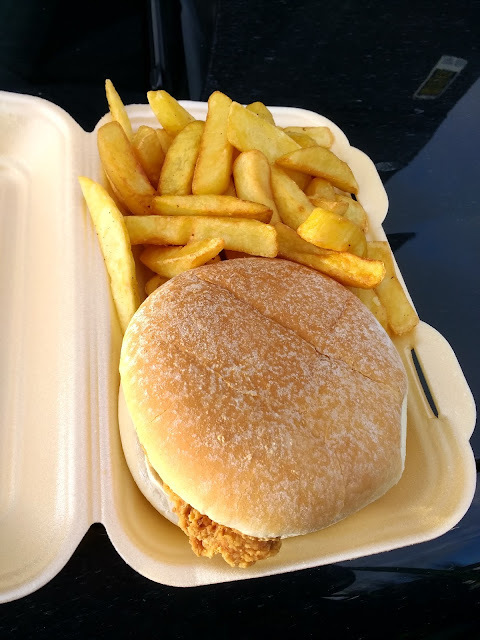 From there I went in search of dinner, having a very good half pound chilli burger with fries for £4.50 from some random Asian place. 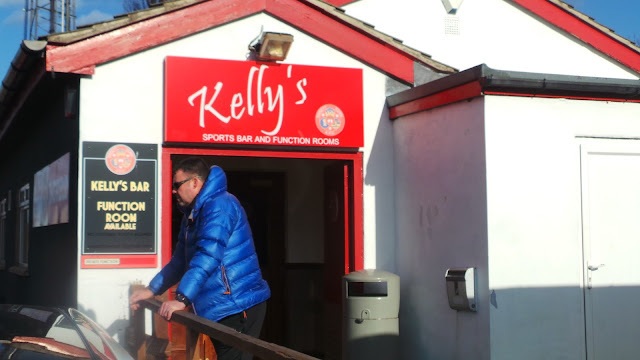 I put the bus station in Google Maps, as it was a good mile away, I was expecting to bump into a decent pub on the way back, but that turned out not to be the case. I got back to my room at 9.40, having had a good day and with most of my electricals needing a good charge. I watched the goal rush and Match Of The Day with a bottle of cider before getting into bed around midnight. INGFIELD was a ground I first visited on 21st April 2007, stopping to get pictures on the way up to Wycombe's game at Darlington. 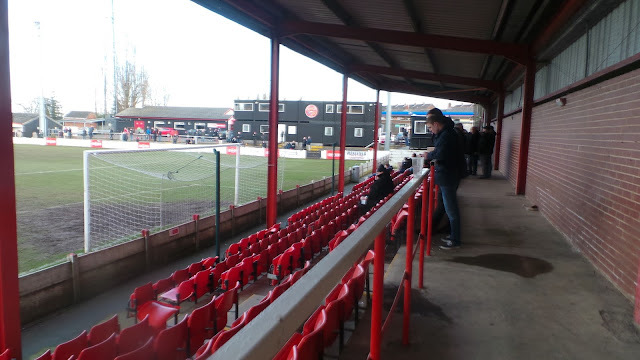 I was impressed with the ground, the seated stand being unusually behind one goal, in addition to extensive terracing, which included 2 further covered areas. 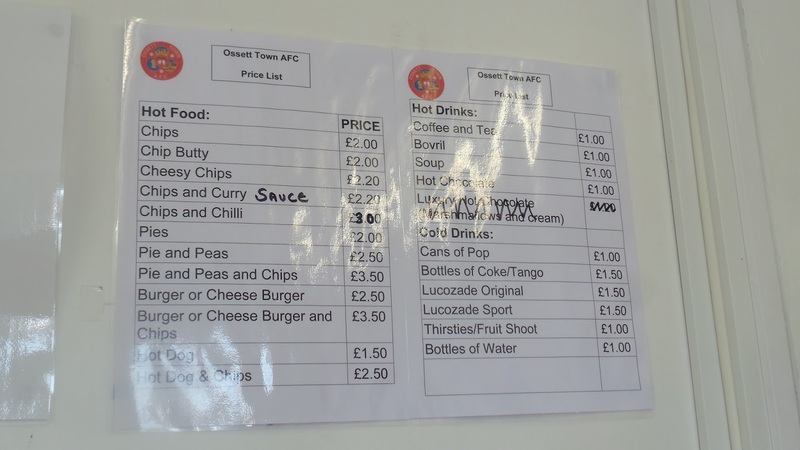 At the ground, facilities are excellent with both bar and tea bar being well above average. 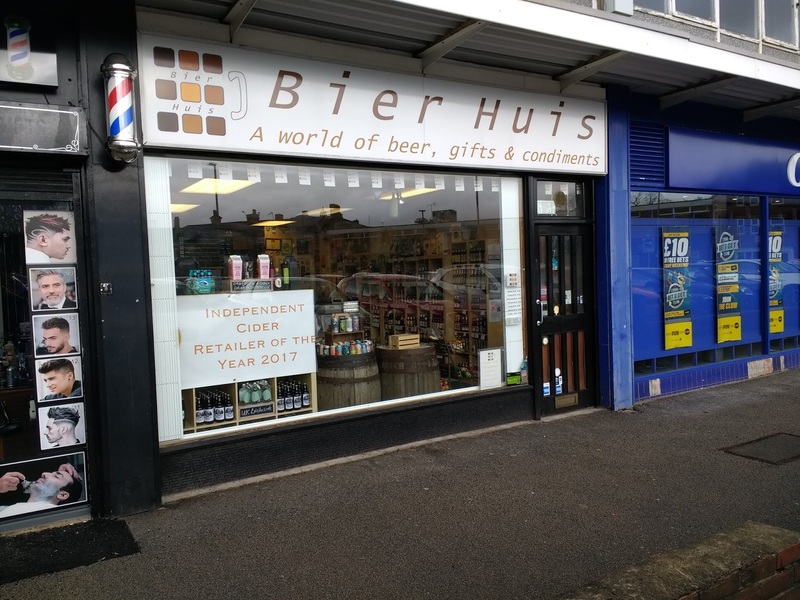 The ground is excellently located for the town with the Beer Huis micropub and off license being a couple of minutes from the ground.